“Honor Thy Father and Thy Mother: The Key to Bringing America Back to Order” was the topic of a presentation by writer John Horvat II held at Our Lady of the Holy Spirit Center in Cincinnati, Ohio on June 7th. 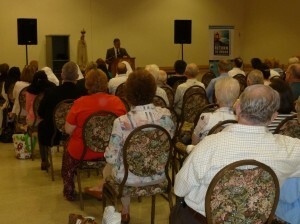 Nearly ninety people attended the light luncheon and meeting, which highlighted the importance of the Fourth Commandment. Mr. Horvat is the author of Return to Order: From a Frenzied Economy to an Organic Christian Society —Where We’ve Been, How We Got Here, and Where We Need to Go.He borrowed some concepts from a few of the book’s chapters to address the question of honor as one way America can return to order. Copies of his book were available and could be signed by the author after the presentation. The theme hit a chord with those attending as Mr. Horvat discussed what honor is and where it is to be found. 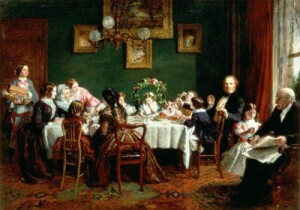 He also explained the important role of the family as a primary place where honor can be cultivated. In fact, families should be fired up with the idea of honor. However, honoring parents means much more than simple obedience. Children honor their parents by doing those things that reflect back on them and thus make parents proud of them. In this way, children increase the honor of their parents whose good reputation and honor is enhanced by the deeds of their children. The Cincinnati event was excellently organized by Mr. and Mrs. Patrick Ashcraft who did a wonderful job of promoting the book in the area. 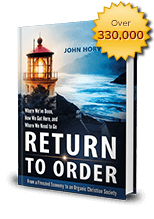 For information on events, to request the author as a speaker or to purchase copies of the book, call (855) 861-8420 or visit www.ReturnToOrder.org. This entry was posted in Featured and tagged America, Catholic Church, false happiness, Family, frenetic intemperance, honor, Return to Order by John Horvat II. Bookmark the permalink.